Jodi: Would you like your own spot in Spirited Reiki I? What is Reiki? And why would you want a spot in my new e-course? Reiki is an ancient spiritual way of channeling healing energy. It is safe, gentle, and can be learned by anyone. It can best be described as a holistic way to balance, heal, and harmonize your mind, body, and spirit. It is, for me, a way of life. It can be for you also. Once you are attuned to Reiki you will experience a greater sense of inner peace and well-being. You will feel a sense of connection to the Universe and to those around you like never before. You will also become a healer. Spirited Reiki Level I also has a twist on it! I am a Holistic Health Practitioner and a Certified Kaizen-Muse Creativity Coach. What this means is that I have created a way of learning traditional Usui Reiki and exploring your inner creative spirit — all at the same time! I have been enjoying Reiki for close to 10 years now and if I’ve learned anything, it’s that Reiki starts inside us. If we are at our best, then the Reiki flows at its best! 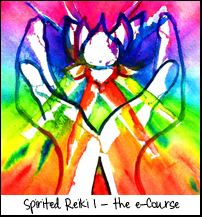 Spirited Reiki I teaches you the history and theory of Reiki while you paint, write poetry, take a hike, or eat a cupcake! You will also be invited to join my private Facebook group where we will share and experience Reiki together for 30 days. If you are feeling butterflies in your stomach because you know that this is something you’d like to do, please enter to win a spot — the FB group opens April 23 and attunements will begin shortly after. *FB group will open April 23rd so that we can all connect before the attunements begin! Your invitation to the group will arrive on the 22nd (if you’ve already registered) or within 24 hours if after that. What an amazing opportunity, yes please I would love to learn this, thankyou for the chance to win this spot in the course. Good luck everyone. What an amazing opportunity. Thank you so much for your generosity. I would love the opportuni. Thanks again! Im always looking 4 new ways to connect my entire being & my creative practices. Sounds awesome! Wow, so up my alley! Always seeking new avenues to connect my entire being w/ my creativity! I read this…and something within me just jumped. I had just ventured over to see what it was about (because another fearless painting sister would definitely offer something interesting! )….and – well, I can’t describe it. Regardless of whether I am blessed to win or the spot goes to one of these other lovely entrants, I know that this is something I need to follow up on with you. Thank you for awakening this within me. This has been something I’ve always been interested in, but never had the opportunity to learn. I would love to win, thank you for the chance! Wow! What an amazing opportunity! I would love it 😀 Thank you! Yes please!!! This sounds amazing! Please enter my name in the drawing. I am so intrigued by the ability of the body to heal itself and to share that energy with others – I’d love to have the opportunity to learn more! I’ve been in touch with Jodi, but wanted to thank you so so much as well! This is such a fascinating opportunity, one that I certainly feel called into. And when that happens, I know the results will be magical.